I had been wanting to do an all white outfit this summer, so I decided to make the best of the Everybody Everywear prompt (which I did not vote for because I voted for hats!) and go for the best summer monochromatic look I could think of. You are definitely a braver soul than I - I'm way too scared to do all white. But you looking amazing. and totally envy the white+white. I never wear all white because my husband picks on me as nannies here wear all white ... he says that people will confuse me for a nanny. I know totally stupid. haha, but you look much better than laundry. I like the addition of all the gold, it really keeps the look bright and polished! The white on white looks fantastic! I love that you broke it up a little with some brown. White looks so good on you! LOVE white on white - and that big embroidered/patch flower? BEAUTIFUL! 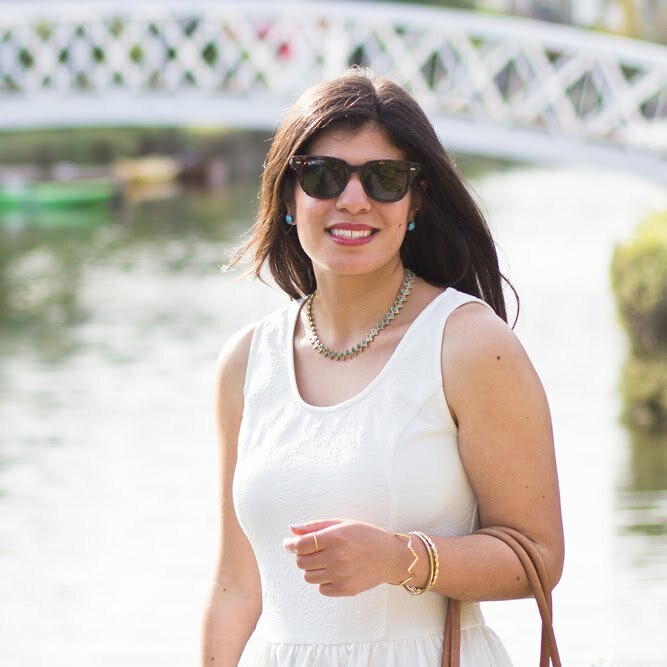 Great take on the monochromatic look - and I love an all white outfit in the summer. All white looks amazing on you! Well, I've been thinking of putting together an all-white outfit for quite some time now, but haven't been able to pull it off yet! You are a great inspiration!! Love it! amazing thrifted bag! I was going to do all white too but chickened out at the last minute ... not sure why ... really like your look though! loving the all white. very fresh! I like all white outfits. It looks so crisp and cool! I love the white on white look in the summer. The appliqué on the shirt helps make it not so monotonous. Excellent job styling, you look killer! Such a fresh summer outfit! Wish I has the guts to wear all white... I am just too messy!! the big white ... you look great in monogromatic white. I have an outfit post coming up that is white too! It's soooo classic and essential for summer. I KNEW you voted for hats! I did too. It's so funny that you went white on white. I almost did the same thing, but ended up with black on black. We are getting really crazy telepathic lately lady. I love your all white look! Classic and fun. Love it. You can definitely pull off the all white look, girl! Love all white. I'm gonna have to try it before summer's end. You look great in all white...but you look great in everything. I would have voted for hats too! But you did great with the challenge at hand. Love this outfit! Classic summer look. I'm terrible with white, so I applaud you for wearing it without any stains or spills. I like the neutral accessories. I haven't done an all white look this summer... there's something so elegant about it. You're pretty much accessorized t perfection here. I missed EBEW again... not that you're surprised at this point. Ugh! hmm isn't it sad that I don't have anything white? wow. Ok maybe gym socks and a bag. You are definitely brave wearing all white, but you look super summery cool in this outfit. I didn't really love any of the choices give this month for EBEW. Hats look terrible on my chubby face, I can't wear shorts, and monochromatic is hard when you can't wear shorts/skirts. wah wah. I wanted pattern mixing! LOVE both of those rings you are wearing. Great score on that thrifted Coach bag! Wow! Love your monochromatic look - the white on white is so pretty! You look absolutely lovely in white. I'm thinking of white horses and unicorns in mythical lands. Love your all white look! I have to try this more often for summer. Your star ring & Coach bag are gorgeous.